CBRs can help practitioners determine where their coding is going wrong. Comparative billing reports (CBRs) are educational tools administered by CMS. 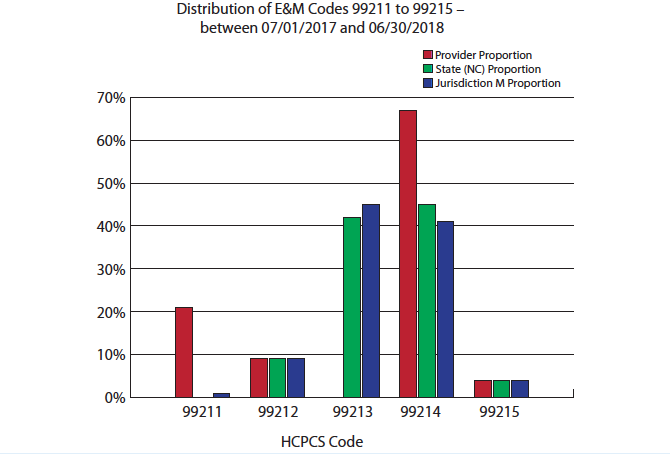 They provide insight into how an ophthalmologist compares to his or her peers at the state and national levels in the use of Evaluation and Management (E/M) examination codes. 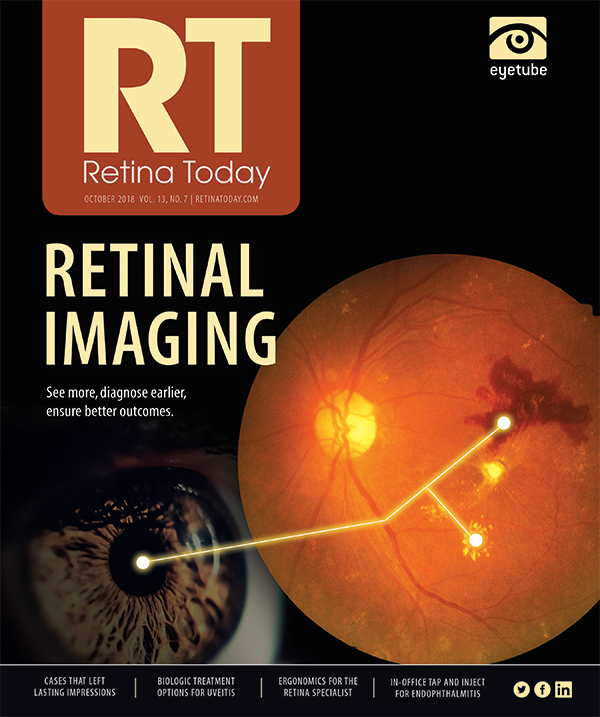 The data in CBRs are not compiled by unique retina taxonomy numbers, and the reports are usually not generated specifically for Eye visit code utilization. CBRs are not intended to be punitive, nor are they sent as an indication of fraud. Rather, the CBR is intended to be proactive, giving ophthalmologists the opportunity to see in which areas they are outliers. Ophthalmologists who follow best practices will conduct internal chart audits to ensure that their documentation supports the level of service they submit for payment. You can request a CBR for each physician in your practice on your Medicare Administrative Contractor’s website. Examination must meet the current (1997) documentation requirements, including a comprehensive history, a comprehensive examination, and moderate medical decision-making. • Which eye (or eyes) has the problem? • How long has it been a problem? • Is there anything the patient can do to make it better or worse? • Are there associated signs and symptoms? And any other information that the physician may need to know. A review of at least 10 body systems is required. For anything to which the patient responds yes, there should be further information to convey what he or she is doing to care for or treat the problem. Documentation of the patient’s history is also required. This includes current medications and family and social history, (eg, does the patient smoke or drink alcohol, and, if yes, how much?). Unless contraindicated, all 12 elements of the examination must be performed through dilated pupils. If, due to trauma or young age of the patient, an examination element cannot be obtained, document the reason, and you will receive credit for performance. To qualify the examination as comprehensive, a mental assessment of the patient is also required. Examination must meet the current (1997) documentation requirements of a comprehensive history, comprehensive examination, and high medical decision-making. • progressive visual field loss, advanced optic disc cupping, and neovascularization of the retina. • Initial office visit for a 29-year-old woman with acute orbital congestion, eyelid retraction, and bilateral visual loss from optic neuropathy. When you conduct your own internal audit, it is helpful to use the AAO’s online E/M Internal Chart Auditor for Ophthalmology (https://store.aao.org/e-m-internal-chartauditor-for-ophthalmology-2nd-edition-online.html) or the paper version in the AAO’s 2018 Retina Coding: Complete Reference Guide (https://store.aao.org/2018-retina-codingcomplete-reference-guide.html). Under what circumstances can a technician bill for an office visit? The answer lies in the Medicare Carriers Manual. An ophthalmologist can bill Medicare and be paid for health care that ophthalmic assistants and/or technicians provide. This is called the incident-to benefit. The ophthalmologist must see the patient first to diagnose the problem. The incident-to rules state that the physician must perform the initial service for the patient and subsequent services frequently enough to reflect the doctor’s active participation in, and management of, the patient’s course of treatment. In the office setting, direct supervision does not mean that the doctor must be in the same room. It does mean, however, that the physician must be present in the office suite and immediately available to provide assistance and direction throughout the time the ophthalmic medical personnel is performing services. To warrant billing 99211, the documentation should include a written order detailing which components of the examination and testing services to perform. Reminder: As a result of past investigations by the Office of Inspector General, CPT code 99211 is bundled with all testing services. CPT documentation states that 99214 requires a detailed history, a detailed examination, and medical decision-making of moderate complexity. For an established patient examination, only two of these components are required. Moderate complexity must be one of the two. • Office visit for a 68-year-old man, an established patient with sudden onset of multiple flashes and floaters in the right eye due to a posterior vitreous detachment. 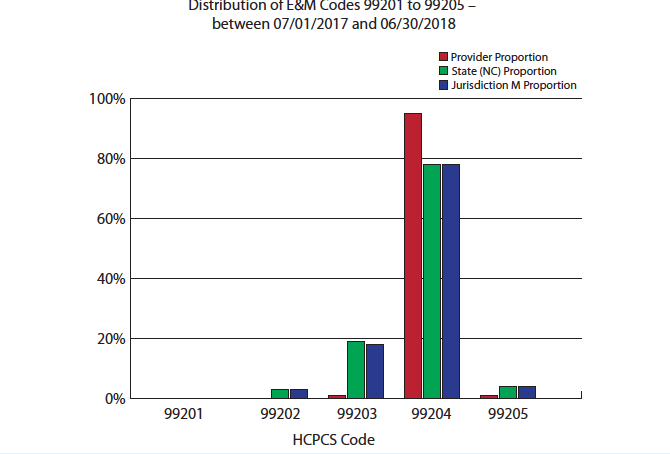 Payers consider E/M code 99214 to be equivalent to Eye visit code 92014. 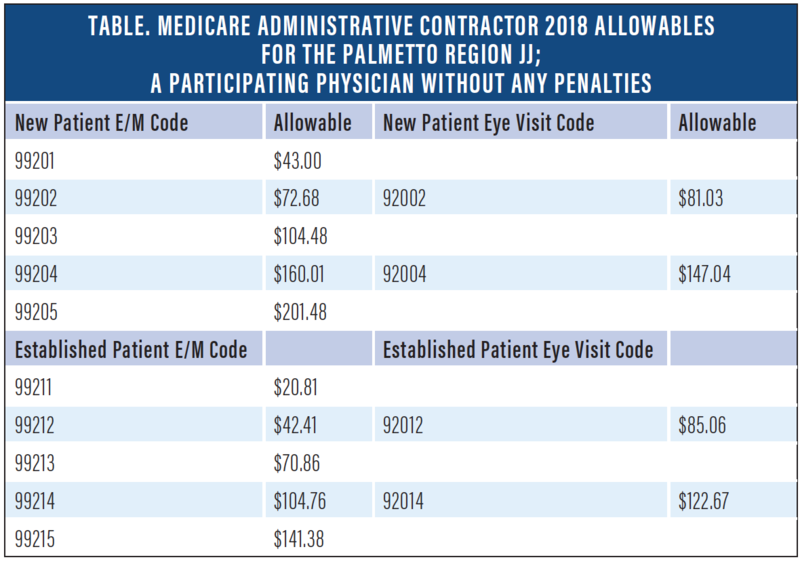 Why does the Eye visit code have the higher allowable for Medicare Part B, as shown in the Table below? The answer is practice expense. Ophthalmic equipment is expensive! No. 1. Read the report thoroughly and take it seriously. Often, these reports are a warning shot indicating that an audit will occur if the pattern of utilization continues. No. 2. Make sure you are submitting claims from the proper family of examination codes. For example, if the commercial payer offers a medical and vision plan, medical diagnoses must be reported with the appropriate level of E/M coding, as the payer may reserve Eye visit codes for vision examinations. No. 3. Conduct your own internal chart audit to assure compliance. Pull a small sample of records from each of the levels of codes for which you are an outlier. The first item the payer will look for is the physician signature. For paper records, the physician signature must be identifiable; you can also submit a signature log. For electronic health records, the physician signature must be secure. No one cares more about your documentation than you do. If you absolutely must have an outside source review your records, give them documentation that has not yet been sent for payment.